Sister Elsie Margaret Humphrey of the Territorial Forces Nursing Service died in one of the cottages in Port Lane, North Hill on 20th April 1920 from tuberculosis, contracted whilst serving in France. Her story is one of hardship, of dedication to duty and of the care she gave others; it is also about how the authorities failed to give her the care and attention which she gave so freely to others. She lived in North Hill parish for just the last ten days of her life, which is why she is buried here. As far as we have been able to ascertain, she is not remembered on any other memorial except, inexplicably, in the Book of Remembrance in Norwich Cathedral. Representations are being made to add her name to the War Memorial in Romford, Essex as this was her home town. Her service record and her gravestone exist but we have not been able to establish any reason for any living person to remember her. Elsie Humphrey's parents were George Humphrey of Mickleham in Surrey and Caroline Taylor. At one time George was a merchant's clerk and later he was a clerk working for one of the railway companies. Caroline was born in Christchurch in New Zealand, the daughter of a well-to-do London timber merchant. 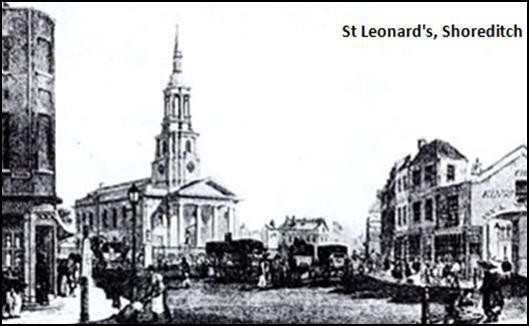 George and Caroline were married in 1878 in the famous church of St Leonard in Shoreditch. Shoreditch was on the edge of the City of London and had a repuation at the time for poverty and squalid living conditions. Caroline had been living with her parents in affluent Harley Street in 1871 and the change to living in Shoreditch must have been significant. The details of the marriage are interesting. The witnesses to the marriage were the parish clerk and an illiterate lady named Mary Braithwaite; no family members were invited to witness the marriage and may even have not attended the service. George Humphrey's age was given as 30, although he was nearer 33. Caroline's age was recorded as 24 although she was not yet 21 and still under the age of consent for marriage without parental agreement. Perhaps their age difference, George's relatively lowly status and the fact that she possibly married without her father's blessing explains why she moved from a more prosperous part of London to Shoreditch. They both gave their address as being in Shoreditch but this may have been a convenience address so that they could be married in St Leonard's; they both gave their respective fathers' occupations as 'gentleman'. They moved to Romford in Essex shortly after the marriage and had four children there: Francis James in 1879, Evelyn Mary in 1880, Arthur Cecil in 1886 and Elsie Margaret in 1888. Evelyn died in 1887 when she was almost 8 years old. The family breadwinner, George, died in early 1890, leaving Caroline as a widow with an 11 year old son (Francis), a 3 year old son (Arthur) and a baby daughter, Elsie. Evelyn was buried on 6th October 1887 and George was buried on 30th January 1890, both in Romford Cemetery. In 1891 the remaining family were living in Victoria Road in Romford. Their home was a whole house and was situated almost opposite the junction with Albert Road. The family had a 12 year old live-in servant with them, a local girl named Florence Asplin. It is likely, though, that the family soon fell on hard times and they moved back closer to the metropolis and closer to the poverty which existed there in Victorian times. Caroline remarried to George John Mann in 1897 in the West Ham area. He was a collector of rates and seven years older than Caroline. With her new husband she had three children born to her quite soon after the marriage: Mary Evelyn in 1898; Doris Harriott in 1899; Irene Winifred in 1901. Sadly, Irene died when just a year old. At the time of the 1901 census Elsie Humphrey and her brother Arthur Humphrey lived in the family home with their mother and stepfather at 48 Tredegar Road in Poplar. Caroline died in 1902 when Elsie was just 12 years old and Arthur was 14. George John Mann died in late 1910. It is likely that Elsie had left the family home by this time to become a nurse. Arthur was already independent and learning a trade as an electrician. The 1911 census also showed that Elsie's eldest brother, Francis, was an engineer staying at The Garrick Hotel in London's West End. Her brother Arthur has not been found on this census but her two surviving half sisters, Mary and Doris, were living in Ealing with their paternal aunt and uncle. Her brother Arthur enlisted in the London Electrical Regiment on 2nd October 1914. Like Francis he was an engineer and was probably already an electrician when he joined up. Clearly he was well thought of in his unit because he had been promoted to acting corporal by early 1915. He appears to have stuck on that rank until late 1917 when he decided to apply for a commission. The successful jump from acting corporal to 2nd Lieutenant in the Royal Army Service Corps (RASC) marks him out as a bit of a flyer. This sort of advancement was not altogether unknown, particularly in the latter stages of the war when the army was experiencing rapid expansion and good officer material (hitherto not so much sought from the rank and file) was likely to be successful. Arthur did not experience active service on any of the fronts. A commission in the RASC on a home station must have been regarded as a safe and comfortable posting when compared to the horrors of Passchendaele and the might of the German Spring Offensive that would follow in March 1918. He survived the war and was a captain upon his discharge. Both of Elsie's surviving half sisters married. The elder half sister, Mary Evelyn Mann married Ralph Bradwin Langton (b 1893 Iver, Buckinghamshire) in Ealing in 1921. They had two children: Cynthia Margery Langton who was born in 1923 in Singapore and Ailsa Mary Langton who was born in 1925 in the Brentford area and died in 2001 in South Devon. The younger half sister was Doris Harriott Mann who married Henry Fawcett in 1924 in the Brentford area. They both died in the Torquay area in 1980 and 1979 respectively. No living descendants have been identified from this branch of the family. The census taken in 1911 showed that Elsie was a 22 year old hospital nurse at Addenbrooke's Hospital in Cambridge. It was here that she met her lifelong friend Mary Alice Brown who will become very important in Elsie's later story. 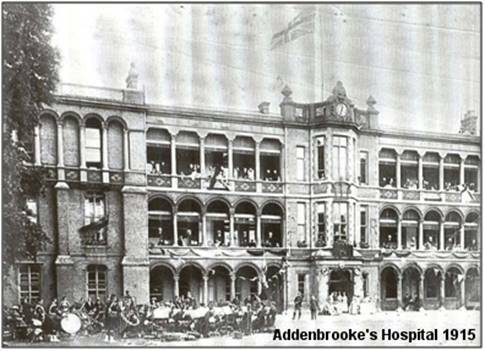 Addenbrooke's was a major training hospital for nurses. Her service record shows that Elsie joined the Territorial Forces Nursing Service in 1913. As this was an auxiliary role and no conflict had yet begun she would have been working full time as a nurse at Addenbrooke's but it does demonstrate her dedication to nursing and providing care to those in need of comfort. The conflict which was to be World War One dragged Britain into the fighting on the 4th August 1914. Exactly one week later, on the 11th, Elsie was mobilised with the Territorial Forces Nursing Service and was posted as a staff nurse to the 1st Eastern General Hospital, Cambridge. At the same time as Elsie was mobilised, so was Mary Alice Brown, who was also a nurse at Addenbrooke's. It is likely that they had been friends for some time and their staunch friendship was to persist over many years. The 1st Eastern General Hospital was established by the Royal Army Medical Corps in 1908. It had a close relationship with Addenbrooke's Hospital as medical and nursing staff served in the 1st Eastern in both world wars. It catered for the medical needs of some of the men wounded whilst serving on the front line. During the First World War, the 1st Eastern General Hospital had its headquarters in Trinity College, with beds in the Leys School and in the grounds of Trinity College, and later in temporary buildings on the cricket grounds of Clare College and King's College to the south of Burrell's Walk. It had over 1500 beds by the end of 1915. Officially the 1st Eastern had 151 Officer beds and 1191 Other Ranks beds, although various wards of Addenbrooke's ended up being considered an extension of the First Eastern, which continued its war duties until 1920. Scarlet Finders gives information on all administrative and organisational aspects of the British military nursing services in France and Flanders during the Great War. The Fairest Force gives us a simple account of how the nursing services arose in the years prior to the Great War, and provides details of things such as contracts, pay, uniform, food, leave, sickness, marriage, discipline and much more. There is a short history and some excellent images of the 1st Eastern General Hospital on the Roll of Honour: Lest We Forget website. 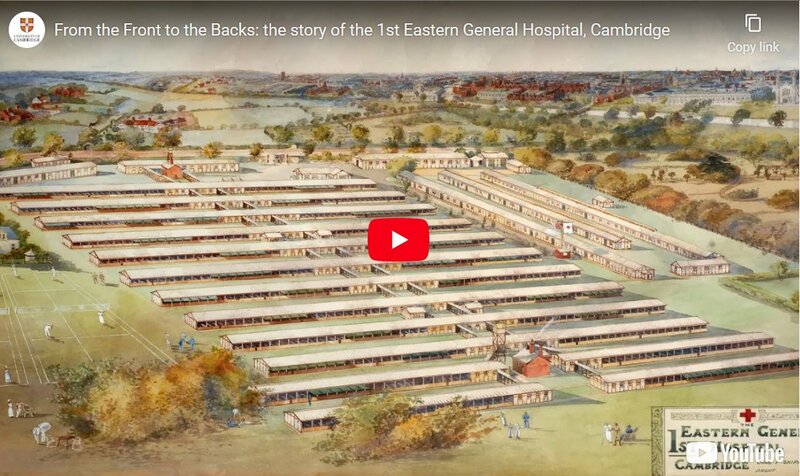 A more comprehensive history of the hospital with a highly informative and sensitive accompanying video can be seen on the University of Cambridge website. Elsie's first annual appraisal came a year later and her matron, Enid Newton, wrote "Nurse Elsie Humphrey has worked for me for the period of one year. She is a fairly good nurse; on the whole her reports are good, she lacks initiative and shows a disposition to shirk the disagreeables. She has quite a pleasant manner and is refined." This document also records her brother F J Humphrey as her next of kin, living at 1 Palace Mansions, Allison Bridge, Kensington, London W.
Another year passed and Elsie's second annual appraisal showed the progress she had made in her career. Her matron, A McDonald, wrote "Nurse Humphrey has worked at the 1st Eastern General Hospital for two years. Very thorough and trustworthy and an exceedingly good nurse. Very good to the patients and liked by them." In April 1917, when approaching her 29th birthday, Elsie's work at the hospital was recognised and rewarded with promotion to Sister. Along with many others, Elsie signed an agreement on the 17th August 1917 saying that she was prepared to work outside the UK. There seemed to still be a need for Elsie to work with returning wounded troops and it was not until 13th July 1918 that Elsie was medically examined and found to be fit to work in a military hospital abroad. Before she left for France, there was still the matter of her annual appraisal, this time by Matron E E Seymour. It read as follows "Miss E Humphrey has been at this hospital since August 1914, was promoted Sister in April 1917. She is a capable and trustworthy Sister, maintains good discipline in her ward and takes a keen interest in her patients' welfare. This was endorsed by her commanding officer's comment of "Very satisfactory". The War Office had, in the meantime, been constructing its latest plan to bring the war to a conclusion. 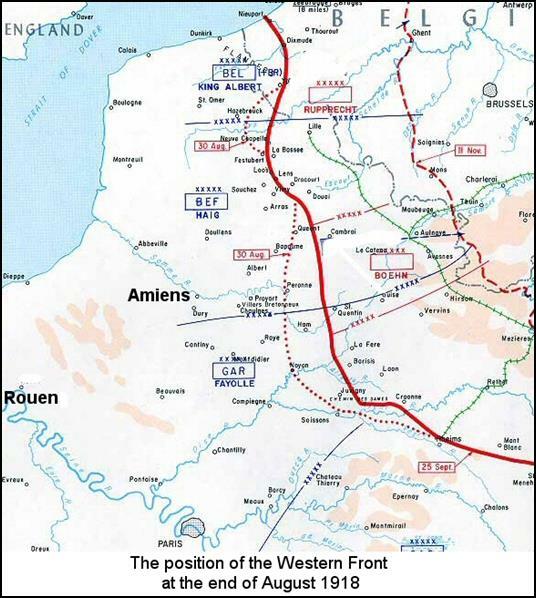 The plan was to start in August with a major offensive on the German forces around Amiens, to maintain the momentum and to clear the Germans from French soil by forcing them to retreat beyond the Hindenberg Line. This would involve a huge number of ground forces and it was expected that there would be a large number of casualties requiring medical treatment. Having spent four years caring for wounded soldiers at the 1st Eastern General Hospital in Cambridge, Sister Elsie Humphrey was posted abroad. On 12th September 1918 she arrived at the No.5 General Hospital in Rouen, 75 miles from where the offensive had already begun. The Hundred Days Offensive, as it later became known, was the final period of the First World War, during which the Allies launched a series of offensives on the Western Front from 8th August to 11th November 1918. The offensive claimed over a million killed and wounded on each side of the line but was followed by the armistice and the war came to an end. During the First World War, Commonwealth camps and hospitals were stationed on the southern outskirts of Rouen. Almost all of the hospitals at Rouen remained there for practically the whole of the war. They included eight general, five stationary, one British Red Cross and one labour hospital, and No. 2 Convalescent Depot. A number of the dead from these hospitals were buried in other cemeteries, but the great majority were taken to the city cemetery of St. Sever. The story of No.5 General Hospital is explained in words and pictures on the Commonwealth War Grave Commission website pages on the subject of St Sever. Although the war was over, there was still much to do in France and Elsie spent Christmas 1918 at her hospital in Rouen, but she was feeling decidedly unwell. On the 28th December, after just 5 months in France, she was diagnosed with influenza. This was the early days of the Spanish 'Flu pandemic. In those times of lack of medical knowledge, post war chaos and the manner in which society had been brutalised by the war it was possibly understandable that a hurried diagnosis was made. On 13th January 1919 it was clear that Elsie was getting no better so she was brought back to England and placed in the care of the Queen Alexandra's Imperial Military Nursing Service (QAIMNS). A medical board considered her condition on 21st January, confirmed the diagnosis of influenza and required that the position be reviewed in a month's time. In the interim, Elsie was officially on sick leave until the 27th February and struck off the strength for France. By the end of a month it was likely that an influenza victim would have been easier to identify, if they had survived the month. A report received from Major D V Haig RAMC, commanding the hospital in Rouen, stated that Elsie was "Not sufficiently robust" for service. His report went on to say "Sister E Humphrey joined this hospital 12.9.18 and has had charge of surgical and medical wards. Her nursing ability was very good. Administrative capacity and initiative fair. She was conscientious and reliable and worked hard but did not seem strong enough for very heavy work. She was admitted into hospital and was invalided to UK on 13.1.19". Later reports stated that she had had influenza several times and that just after her medical board her temperature was recorded as 103.4 degrees F. It was agreed that her condition was directly attributable to her service as this was clearly where she was infected. 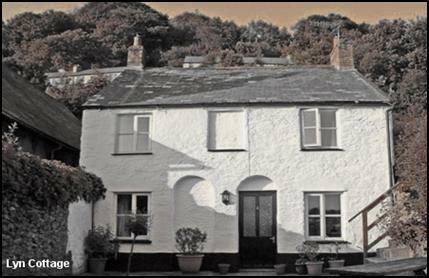 Elsie had taken rooms at Lyn Cottage, Lynton, Devon for the period of her sick leave and it seems that she was convalescing near the sea where the air would have been thought to be beneficial. She was required to attend the planned medical board at the end of February when her allowed sick leave came to an end. Elsie opted to come to London for the medical board because the tenancy on the rooms in Lynton expired on 27th February. The authorities were reluctant to provide her with a free railway pass for the journey because they could set up a medical board closer to Lynton. This was the subject of some distress to Elsie and she wrote to the War Office explaining the situation but received no sympathy for her position. The medical board maintained that Elsie's condition was influenza and that whilst she was not fit for service overseas, she could return to duties in the UK and was ordered to be sent back to the 1st Eastern General Hospital in Cambridge. The board wished to review the matter after a period of three months. Returning Elsie to duty may have seemed harsh but a letter from the Matron in Chief of the TFNS to the hospital explained that this may have been both pragmatic and in line with Elsie's wishes, who was probably feeling a lot better. The letter, dated 4th March, read "I shall be glad if you will let me know by return if you have a vacancy for the following TFNS member: Miss E M Humphrey, Sister - belonging to your unit who has returned from services abroad. This member has no home and is very anxious to be posted back to the 1st Eastern General Hospital as soon as you can possibly take her." No mention was made of Elsie's medical condition. The Principal Matron of the 1st Eastern General Hospital replied the following day expressing her eagerness that Elsie should be returned to them. On that same day Elsie was treated at the QAIMNS hospital for a swollen foot but there is no indication that she was re-admitted. 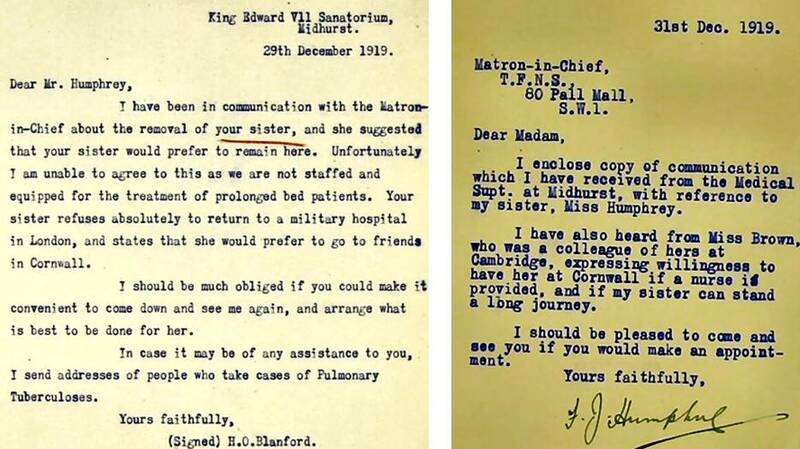 On the 7th March Elsie was sent a letter telling her to report for duty to the hospital in Cambridge on the 10th March and was also sent the appropriate travel passes. Having returned to duty, Elsie was still subject to the review by the medical board. Before the board had the opportunity to meet, however, Elsie broke down again. Her period in work had only lasted a fortnight before she was again feeling unwell. The medical board was convened in Cambridge on the 25th April. 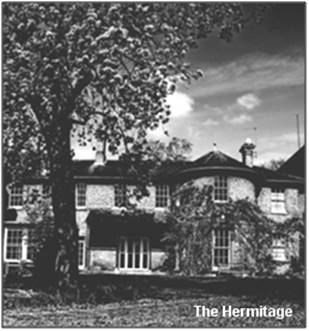 At that time Elsie was living in The Hermitage, Newnham, Cambridge. The board report showed that Elsie was still suffering from whatever it was that ailed her but were categorical in what is was not. It was not tuberculosis. The report records "Since last board [Elsie Humphrey] has returned to duty but has not been feeling well. On 4.4.19 she went sick and has been under observation in S.5.Q. 1st Eastern General Hospital since. There is a frequent slight rise of temperature, generally in the evening, sometimes in the morning. Langour, easily fatigued, no cough. Poor general condition; thin. ... No cough. No TB." The board's view was that it would be two months before Elsie was capable of duties in the UK and six months before she could work overseas. At the end of another two months another medical board would review her condition and her sick leave was extended until the 25th June. Elsie returned to the seaside where, once again, the clean air would be of benefit to her. This time she went to stay with one of her relatives in Frinton in Essex before moving on to a convalescent home on Clarendon Terrace in Brighton. Whilst in Frinton, Elsie became increasingly unwell and on the 20th May the relative called in a doctor who, having found Elsie's temperature to be 103 degrees F and having been acquainted with the circumstances, recommended that she be taken to the Military Hospital in Colchester. The Colonel at the hospital agreed to take Elsie and by the following day she was ensconced in the sick quarters with a temperature of 102 degrees F. A sample of her blood was taken and sent to the laboratory for analysis. Four days later Elsie was still in the same ward but progress was being made in the diagnosis of her condition; clearly the blood sample had helped with this. 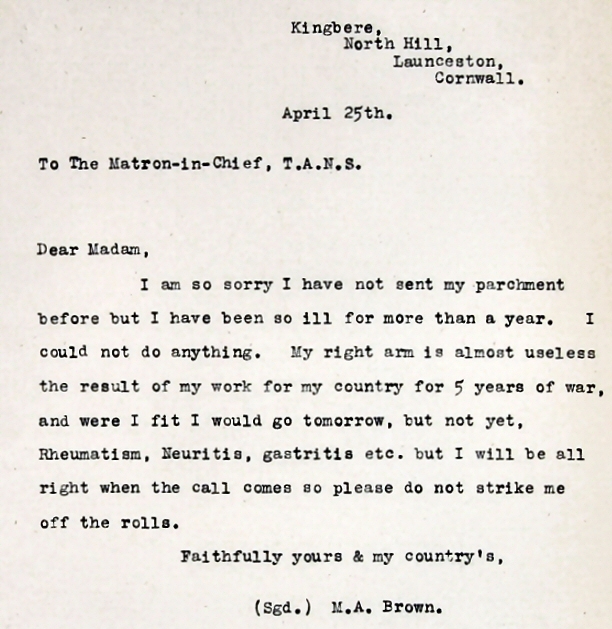 A letter was sent from the hospital by the matron, S A Brown, on the 25th May to the Matron in Chief of the TFNS which reported that they believed that Elsie had tuberculosis and that the nursing of her was taking place outside during the day, as was customary at the time. A sample of her sputum had been taken on two occasions to assist with the confirmation of the diagnosis and tuberculosis was indeed confirmed, after almost six months of medical experts telling her that she had 'flu. Elsie responded slightly to the nursing she received at Colchester. She was due to appear before her medical board in the near future and the hospital in Colchester wrote to the TFNS Matron in Chief on the 5th June asking if there would be any choice of sanatorium for Elsie and pointed out that Midhurst should be recommended to the board. Elsie continued to respond to the care she received at Colchester and her temperature was being held below 99 degrees F.
The medical board was held in Colchester on the 16th June and it was duly recommended that she be transferred 120 miles away to a private nursing sanatorium, the King Edward VII Sanatorium in Midhurst, Sussex. The matron at Colchester continued her sympathetic treatment of Elsie and arranged for Elsie's friends in the neighbourhood to be informed of Elsie's condition. She wrote to TFNS that she would send Elsie as a "cot case" accompanied by the matron's assistant. It seemed that everything was now in place to make Elsie more comfortable with the right care in the right place. Everything was not as it seemed and Elsie's case became a problem which nobody wanted to solve. After a month and a half's delay Elsie was still in Colchester and the Colonel of the hospital wrote to the local Assistant Director of Medical Services (ADMS) on 31st July asking that Elsie be moved to Midhurst as soon as possible. The ADMS passed the problem onto the War Office who passed it around amongst themselves. The Colonel wrote again on 11th August asking how the request for Elsie's move was progressing as she needed the proper treatment that a sanatorium could give. Ten days passed and he wrote again, emphasising this time that Elsie was an infectious case, that Colchester did not have the proper accommodation for her and that she should be either at Midhurst or in a hospital that had appropriate facilities. More time passed and on the 25th August the Matron in Colchester sent a telegram to the War Office saying that "Sister Humphrey had had a relapse and hoped to be fit to travel in 3 days". Three days later another telegram was sent saying that Elsie could now be moved and that an early date would be most desirable on medical grounds. This was acknowledged the following day by the War Office who said that they thought that the transfer arrangements were being made by the people in Colchester. As it was now clear that was not the case, the War Office wrote a letter to Midhurst asking them if they had a vacancy for Elsie. A further three months had elapsed since Elsie was first admitted to Colchester and diagnosed with TB. 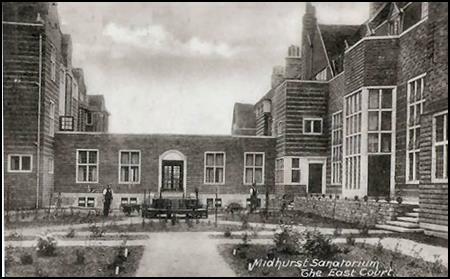 The Acting Medical Superintendent at the Midhurst Sanatorium responded with a terse reply on the 1st September to the War Office saying that Colchester had telephoned them on Saturday evening asking about Elsie's admission to the sanatorium, clearly the first he had heard of Elsie Humphrey. He had sent a set of their rules to Colchester and asked for a medical certificate on Elsie's condition. He pointed out that Elsie was a cot case and only early cases of TB were admitted to Midhurst, but he would see what could be done to offer her a place. He followed this up on the following day by an offer of a probationary placement at the sanatorium which may be available "in about three weeks". If the probationary period was successful then her stay there could be extended. There was no specified time period for the probationary period and Elsie could have been asked to leave at any time at all. When the Colchester Hospital heard about the potential delay they immediately sent off a letter to the War Office pointing out that they had received orders to close their hospital immediately and were unable to keep their patient, Sister Elsie Humphrey, any longer. To solve the problem of where to send Elsie, now that there was no definite place for her at Midhurst, they sent Elsie to the Royal Herbert Hospital in Woolwich, a military hospital, on Monday 8th September. They asked the War Office to ensure that both the establishments in Woolwich and Midhurst kept in communication regarding Elsie's condition and potential transfer to sanatorium care. By the end of September 1919 a period of nine months had elapsed since Elsie first fell ill. In that time Elsie had also suffered a succession of relapses and misdiagnoses as well as the administrative failures in the War Office which prevented her from getting the treatment she both needed and deserved. On the 30th September Elsie's eldest brother, Francis stepped in to see if he could help to get her the proper treatment. He wrote to the War Office on Tuesday asking for an appointment on Friday afternoon, 4th October. He was offered an appointment at 11 0'clock on Friday morning. A note of this meeting was recorded by the War Office and reads "Brother who is very anxious about his sister has taken a cottage for her near Newquay (when? / until?) she is better". A note in Elsie's service record which was prepared by the Royal Herbert Hospital on 15th October states that she was admitted there on 8th September, as expected when the Colchester Hospital was closed, but was discharged to the Midhurst Sanatorium on the 15th October. A letter from Midhurst confirmed the date of her admission as being the 15th. None of this seems to take into account Elsie's potential trip to Newquay which appears not to have happened. There then followed a protracted chain of correspondence about who was going to pay for Elsie's stay at the sanatorium, how the payments would be made and whether Elsie has received all her entitled income. She really did not need to become embroiled in these matters but they were eventually sorted out. Francis visited his sister at Midhurst and continued to be concerned about her health. 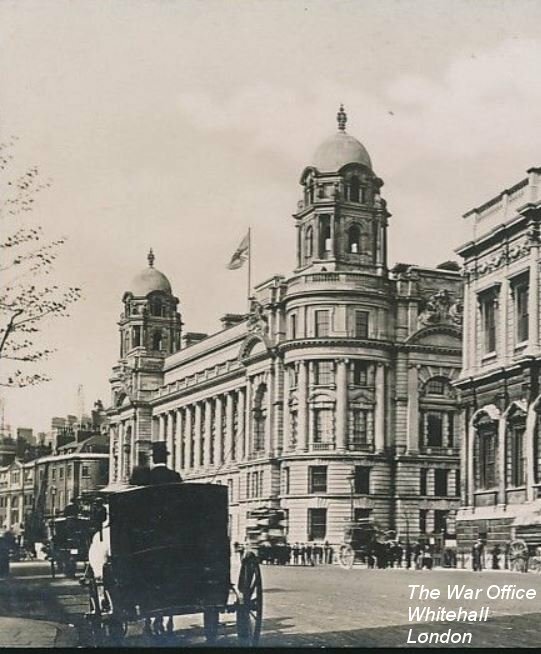 He called upon the War Office in Whitehall (pictured right) on the 22nd December to make sure that they understood that her condition was worsening. He was also under some pressure from the sanatorium to move Elsie because they considered her case too advanced for their care profile. The War Office agreed and suggested that he take her to his home in Palace Mansions. Francis pointed out that there was nobody in his rooms who could look after her. The only suggestion that the War Office could come up with was to send Elsie to the Millbank Military Hospital, although it was thought that would not be so good for her either. Nonetheless a date was set for her to travel on the 7th January 1920 to Millbank, the date of her next medical board. On 28th December 1919, a year to the day from when Elsie first felt unwell, the sanatorium wrote to the War Office saying that as her condition was worsening that they would not be able to keep her. The sanatorium was, they maintained, not equipped to deal with advanced cases and Elsie should be re-admitted to a military hospital. At the same time the sanatorium wrote to Francis saying that whilst she might want to stay there, it was not possible and that he should journey down to start to make arrangements for her to move elsewhere. 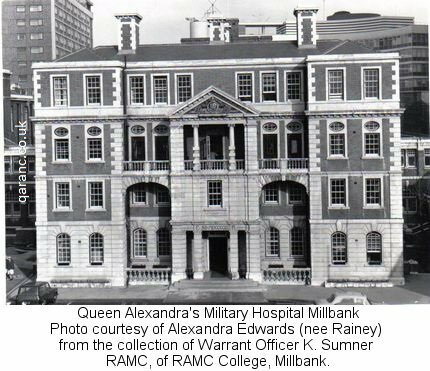 With no other options apparently available, plans were put in place for Elsie to transfer to the Millbank Military Hospital run by the QAIMNS and an ambulance was ordered to take her there. The plans were scotched, however, by Elsie. She put her foot down. She was not going to a military hospital. She told the sanatorium authorities that she wished to stay with friends in Cornwall, probably Sister Mary Alice Brown of the TFNS who had rented a cottage in North Hill. Elsie and Mary had become friends when they were serving at the 1st Eastern General Hospital in Cambridge. The sanatorium readily agreed as they really wanted Elsie out of their premises as soon as possible even if it meant that she would have to stay a few more days whilst Francis wrote letters organising where Elsie was to go next. On the last day of 1919 Francis wrote to the War Office and his letter is shown here. Sister Mary Alice Brown said that she was prepared to provide a home for Elsie in Cornwall provided a nurse was made available and that Elsie could withstand the journey. Mary was incapacitated through rheumatism and her capability to tend for an advanced TB case in a poorly appointed isolated cottage on the flanks of Bodmin Moor seems not to have been considered. This may have been more difficult to organise as Francis then went to Midhurst and persuaded Elsie to agree to the transfer to Millbank. It is possible that Elsie's condition would have worsened under the effects of a 200 mile journey in a rudimentary ambulance on rough roads to Cornwall. The date and time was set for her to leave Midhurst and travel to Millbank. The ambulance would collect her at 11 a.m. on the 7th January 1920. Along with the driver and his mate there would be a Sister in attendance to support Elsie through the 55 mile journey. As with almost all aspects of Elsie's life since she contracted TB, things didn't go smoothly. Neither the driver of the ambulance, his mate or the Sister knew where Midhurst was. They had no maps and a sergeant had told them it was in Kent, so that was where they went. At some point, having arrived in Kent, they established that Midhurst was in Sussex so they drove there, arriving at 7:30 p.m. This was far too late to move Elsie so the sanatorium arranged to make up sleeping accommodation for the men and the Sister with the plan that the transfer would take place the following day. For this accommodation the sanatorium sent a bill to the War Office for payment saying that the charge for the men was less because they slept on stretchers whilst the Sister had a bed. On the 8th January 1920, much to her dislike, Sister Elsie Humphrey was admitted to the Millbank Military Hospital in London. A medical board reviewed her case on the 22nd March and found Elsie was very poorly from the TB and emaciated. She told the board that she wished to go to her home in Cornwall. The Medical Officer in charge of the case and the Board agreed that this would be a satisfactory outcome but until that could be arranged, Elsie would remain at Millbank. The details of the medical board were passed to the War Office and because they stated that Elsie was now wholly unfit for any more service the process was put in place to discharge her not just from Millbank Hospital but also from her beloved TFNS. Her service record shows she was discharged from the hospital on the 29th March. This was followed two days later by a letter from the War Office thanking her for her service during the war. 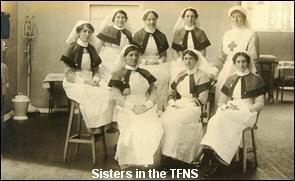 The letter from Sidney Browne, Matron in Chief of the TFNS read: "As you are leaving the Territorial Force Nursing Service, I wish to take this opportunity of thanking you for the good service you rendered during the war. Your work was excellent and was fully appreciated by all those under whom you served. Her Majesty Queen Alexandra has graciously given permission for you to retain your TFNS badge as you have completed four years' service during the war". As part of the discharge process a report was requested from the 1st Eastern General Hospital. It read as follows, "Miss E Humphrey worked at the 1st Eastern General Hospital, first as staff nurse and afterwards as a Sister from August 1914 to September 1918, was sent overseas and returned to the 1st Eastern General Hospital in March 1919. She was a kind and reliable nurse and took great interest in her patients' welfare but did not prove able to accept much responsibility". On the 9th April the official letter discharging Elsie from military service was sent to her at her new home in Kingbear in North Hill in Cornwall where she was living with friend Sister Mary Alice Brown TFNS. Elsie's time in the TFNS came to an end on that day. The War Office wrote to Elsie, "I have received the proceedings of a medical board dated 22nd March 1920, held for your examination, and I regret to note that you have been pronounced permanently unfit for further military nursing services. Your engagement has been terminated from the date of this letter, i.e. 9.4.20 ... R A Riddell, A/Principal Matron, T.F.N.S." A plethora of memos was sent to various departments to tie up the loose ends regarding Elsie's pay and pension arrangements. Elsie had maintained that she had not been paid since December. Elsie Humphrey's service record can be downloaded from The National Archive, click here. North Hill is a country parish in Cornwall and is divided into two by the River Lynher which crosses it from north to south. Whilst the eastern side is rolling farmland, the western side is on the steep flanks of Bodmin Moor, leading up to the open moor itself. Port Lane is in the western half and has two old cottages standing near to one another half way up the very steep hill from Berrio Bridge (Beriowbridge on the map) to Kingbear. Port Lane would have been far too steep for somebody in Elsie's condition to negotiate and it is most likely that the journey up to the cottage would have been the last one she made whilst alive. 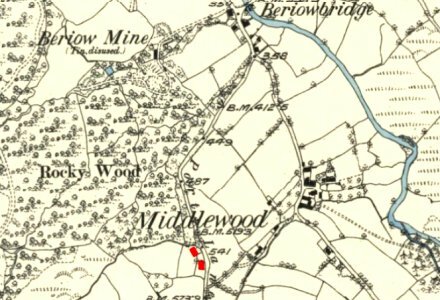 Sister Mary Alice Brown had rented one of the two cottages shown here in red. It is believed that the northern cottage was where she lived and cared for her great friend, Elsie. This cottage was owned and rented by the Budge family. One time long term local resident Bill Budge had a memory of his father talking about two ladies who lived together in the Budge's cottage in Port Lane in the 1920s. 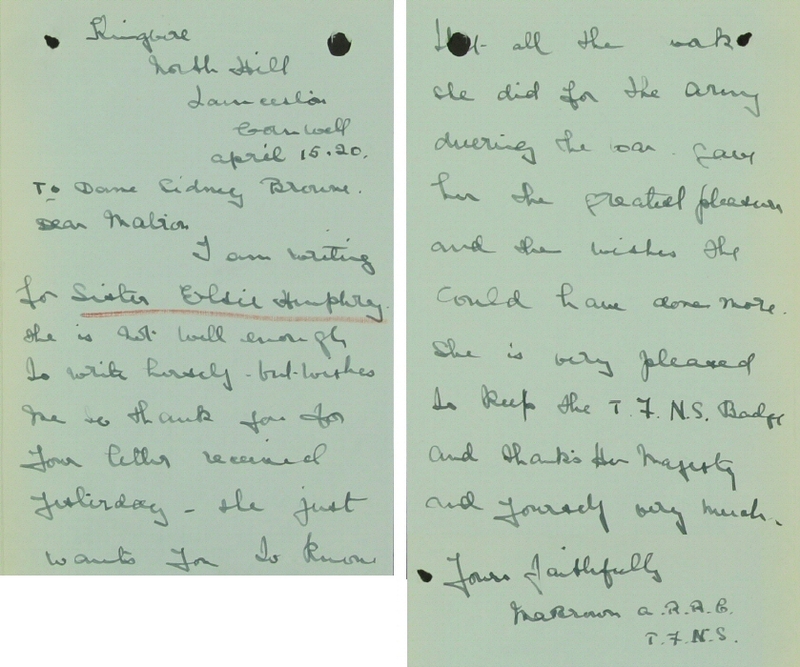 By the 15th April Elsie had become so weak that she was unable to respond personally to her own correspondence and so her friend Mary Alice Brown wrote on Elsie's behalf. The letter below clearly shows Sister Elsie Margaret Humphrey's dedication and love for her service had not been dented by the manner in which her own medical condition had been handled. Elsie died on the 20th April, probably before she had received a reply to the letter shown above. She was 32 years old and had served in the TFNS for over 5½ years. She was buried three days later on St George's Day in St Torney's Churchyard. The gravestone of Elsie Margaret Humphrey in the Churchyard of St Torney's Church, North Hill, Cornwall. Elsie never married. Indeed it was a requirement of the times that nurses be single but from reading Elsie's service record it is clear that she was wholly committed to nursing the injured soldiers that came into her care. Elsie never made a will. This seems surprising when you consider the number of casualties that she had come across in her nursing career. It was common knowledge that soldiers were encouraged to write their wills before going into battle and that as a nurse who would have understood the uncertain future for one, such as her, who had been diagnosed with tuberculosis. It must be remembered, though, that she was just 32 years of age and she always saw her future as back at the bedsides of those injured servicemen that needed her nursing skills. Elsie's estate amounted to £497 2s 9d; this would be about £22,000 if measured in today's terms. The administration of the estate was awarded on the 20th August to her elder brother Francis James Humphrey, an engineer. Elsie's home address was recorded as 1 Palace Mansions, Addison Bridge, Kensington in London, which was where both her brothers lived. It would seem that whereas Francis had been the prime mover in Elsie's affairs before she died and that he was the adminsitrator of the estate, after her death her other brother, Arthur, picked up the reins of dealing with her affairs. Elsie's gravestone is recognized as being one of those for which the Commonwealth War Graves Commission has responsibility. It is not of the usual design and is made of a substantial block of granite once surmounted by a granite cross. The cross which was placed on top has now fallen off and is placed behind the base. It is not known who paid for this to be erected. It would have been expedient for Mary Alice Brown to have made the funeral arrangements locally. Given that Francis had toiled against bureaucracy to help his sister it would not be unreasonable to suspect that he made his way to North Hill for her funeral and erected the stone from the proceeds of the estate. It would be generous to think that Arthur also managed to be there as well. Click on the image above to see the poster generated to remember Elsie for the launch of North Hill's book "The Fallen of North Hill". The poster was created before it was understood that the image shown was not that of Mary Alice Brown (see below)..
Elsie was eligible for the British and Victory medals (shown left) because she served in France from 10 September 1918 to 13 January 1919 and they, were claimed by her brother, Francis Humphrey. They were issued at some time in 1923. 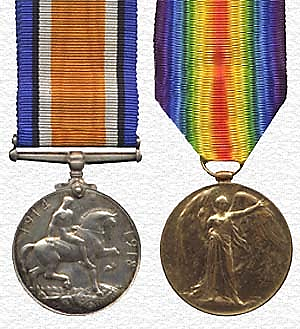 Elsie may also have been awarded The Territorial Force War Medal (shown right). 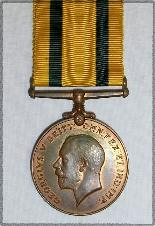 Her name appears on the medal roll which has been transcribed on the Fairest Force website. The author of that site writes "I can't see that there is any other woman in the TFNS with that combination of initial and surname, and the criteria are so complicated that many nurses did qualify even if they didn't have the pre-war qualifying service". A letter from the Matron in-Chief of the TFNS to Francis written on 21st September 1921 states "The condition which makes a Member eligible [for the Territorial Force War Medal] is that she should have been an enrolled Member of the TFNS for four years prior to the outbreak of the War, and, in consequence, I very much regret that your sister was not eligible as she was not enrolled until 1913." Francis did not contest this decision. This anomaly has not been resolved. Elsie's father and sister, buried in Romford Cemetery (or Crow Lane cemetery as it is known locally), had no headstone at all. The Essex Commemoration Project have undertaken to have Elsie remembered in Romford. On 29th August 2014 Steve Fifer of the project wrote "We have a meeting with Havering council ... and we will certainly highlight Elsie's case as one that illustrates missing names and some of the reasons why this is. .... I am adding Elsie to our Havering database and will exert our best efforts to have her added to the Romford War Memorial where she deserves to be." For as yet unexplained reasons, Elsie is remembered in the Book of Remembrance in Norwich Cathedral (read more about this). The book was compiled in 1932 to mark the opening of The Memorial Chapel and names for inclusion were submitted primarily by people local to Norwich. Elsie's parish was noted as being Norwich but this was often used as a generic and inaccurate term. Could it be that one of the soldiers that Elsie had nursed remembered her name and submitted it for inclusion? Maybe he was a sweetheart as well? It is unlikely that this mystery will ever be solved. There are two coincidences worthy of mention. Elsie's best friend was Mary Brown, the matron looking after Elsie's best interests at Colchester was S A Brown and the Matron in Chief at the War Office who was dealing with her case was a Browne. The second concerns the address of the firm of solicitors engaged to settle the issues of Elsie's pay, expenses, war gratuity and other entitlements from the War Office. Resolving Elsie's estate became a protracted affair and Francis and Arthur engaged a firm of solicitors whose address was in North Hill, Colchester. Sister Mary Alice Brown of the TFNS was not a local lady. She had been born into a large family in Louth, Lincolnshire in the spring of 1869, the daughter of Charles Brown and Mary Ann Wilkinson. She had served with the nursing service since 1897 and had been trained at Guy's Hospital in London. Mary also worked at Addenbooke's Hospital in Cambridge and then at the 1st Eastern General Hospital before being demobilised in 1919. Initially her specialism was midwifery but for the duration of the war she was a very successful Sister at the 1st Eastern General hospital for wounded soldiers but she never served overseas. For her services to nursing she had been awarded the Royal Red Cross in 1917. In a letter that she wrote in May 1920 to her employers, Mary stressed that although she had been unwell and her handwriting was 'dreadful' she asserted she was getting better. She wrote "... I know I have been very ill but I hope to get well again ready for the next war. The ministry are trying to send me to Bath for treatment at the mineral baths etc ...". Mary had, amongst other ailments, severe rheumatism which was the cause of her eventually leaving the service in 1925, having remained notionally on the roll of the 1st Eastern General Hospital, but inactive, for some while. Taking on the role of caring for an advanced TB case in a cottage with few amenities in an isolated Cornish parish on a very steep hill appears daunting enough. Adding to that challenge the fact that Mary was herself unwell can only demonstrate the depth of her friendship with Elsie. Mary Alice Brown was also invalided out of the service. Mary spent some time in the military hospital in Orpington in Kent. Later, she lived in various places in the west country. Records suggest that she died in 1938 in St Columb Minor near Newquay. Mary Alice Brown's service record can be downloaded from The National Archive, click here. The record WO/359/10059 contains an image which would appear to be Sister Mary Alice Brown, the subject of the record. The caption indicates that the image is Sister Mary A Brown of the QAIMNS who was awarded the Military Medal. The image is Sister Mary Ann Brown and should be filed with her record. Sister Mary Alice Brown was in the TFNS, not the QAIMNS; her record makes no mention her winning the Military Medal. This was pointed out to The National Archives in June 2018 who responded as follows "I am afraid we cannot help with your request. Whilst it may be that you are correct and this newspaper clipping actually refers to a different individual it is an integral part of the file as we received it from the War Office and we are not able to add or remove things from files and so alter the Public Record." This image was used in 2014 to represent Sister Mary Alice Brown in "The Fallen of North Hill" and must now be seen as an incorrect image.